Luton Airport Parking can be either on-airport or off-airport. For details of Luton Airport Parking options simply select from the map or the following list to view the facilities which suit your needs best. We are certain that with our price match guarantee you will find the best possible price for your Luton airport parking. We guarantee you won't find cheaper airport parking at Luton! Check in your car and keys for rapid transfer to the airport - keys are never left in your car. 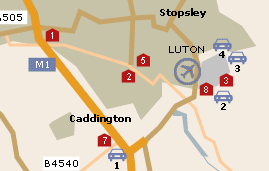 Luton Airport Guide has been developed to provide a handy reference for those travelling to, from or through Luton Airport, as well as those looking for historical information and facts. We have compiled information on every aspect of Luton Airport to help you find exactly what you're looking for, easily and quickly. Those wishing to drive to the airport will find it easily accessible from the M1 and well sign posted from the access roads. The airport offers a range of both short and long stay parking. Luton airport has one terminal which serves over 15 different airlines flying to over 60 destinations.